I get a lot of unusual things in my email in-box. It's a side effect of running a blog and doing a lot of freelance writing. However, one of the weirdest - yet also one of the coolest - things that I have stumbled upon in a long time is Influenza Sorbet by the folks at Jeni's Splendid Ice Creams from Columbus, Ohio. Influenza Sorbet is flavored with Cayenne pepper, ginger, Maker's Mark bourbon, and honey as well as orange and lemon juices. These ingredients are formulated to alleviate cold and flu symptoms. The closest store to the Warrendale neighborhood that sells this is Market Fresh Fine Foods (31201 Southfield Rd. in Beverly Hills). 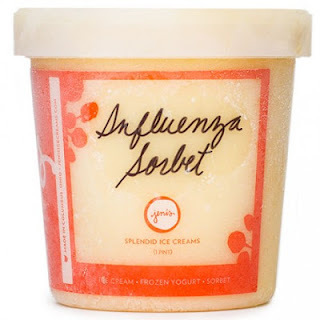 If you don't want to make that commute, Influenza Sorbet is also available for home delivery via Jeni's website. You have to order four pints of their ice cream to get it delivered. However, it's worth it. Influenza Sorbet (two words that I never thought I would connect together) is your Warrendale Tip of the Week for this week.